Lunchtime visit and a good food trade. Good banter with the landlady. Okell's - Bitter 3.70 A little cold. Early afternoon and we needed to eat, so we sat in the front bar is predominantly dining, the rear bar being mainly for wet sales. Large portions of good quality food combined with good ale made this a very good choice. A warm and sunny day, we sat outside and watched the world go by. The service at the bar was absolutely excellent. The pub is found in Peel, Isle of Man, IM5 1AT. Attractive pub in Station Place that is particularly spacious inside. There is a comfortable lounge bar at the front of the pub in addition to a large public bar/games room which is also used for live music events. 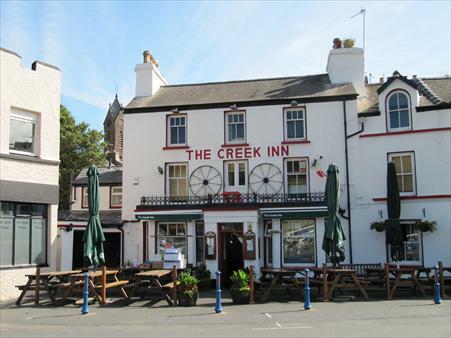 The pub is situated opposite the site of the former Peel railway station and boasts a Station Hotel mirror in the bar. We have visited this pub 3 times, seen 16 different beers and tried 3 of them.